Nikolai Astrup (1880–1928), March Morning (c 1920), oil on canvas, dimensions and location not known. Wikimedia Commons. 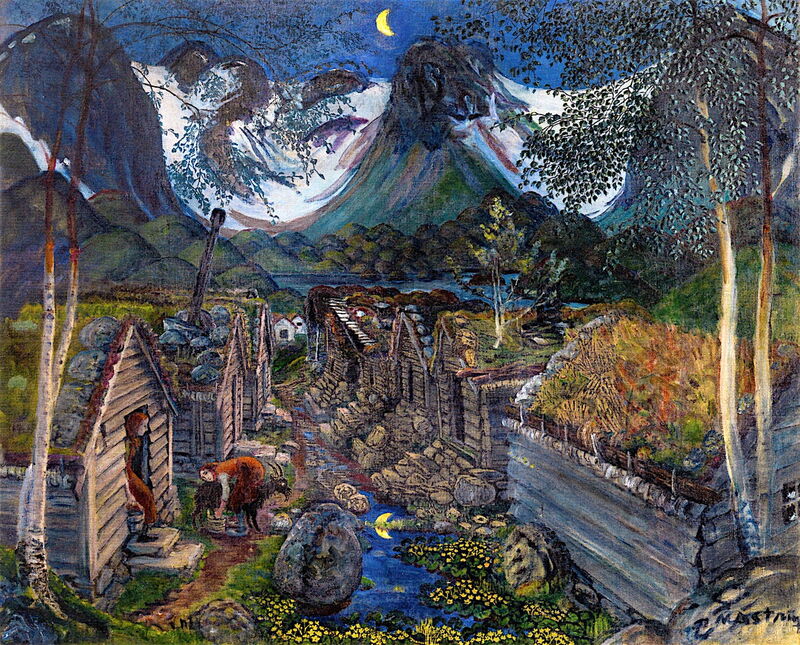 Over the last three weeks, I have posted series of articles outlining the careers and work of two landscape painters of the early twentieth century: the Norwegian Nikolai Astrup (1880-1928), and the Briton Paul Nash (1892-1946). Although I had never intended the two series to overlap in the way that they have, this article seizes the opportunity to compare and contrast their lives and work, as roads to their painting magical landscapes. Both suffered from asthma, and both died early as a consequence of chronic chest disease. In Astrup’s case, as well as being asthmatic from his childhood, this was the result of pulmonary tuberculosis, which was still a common cause of early death in rural parts of Norway. 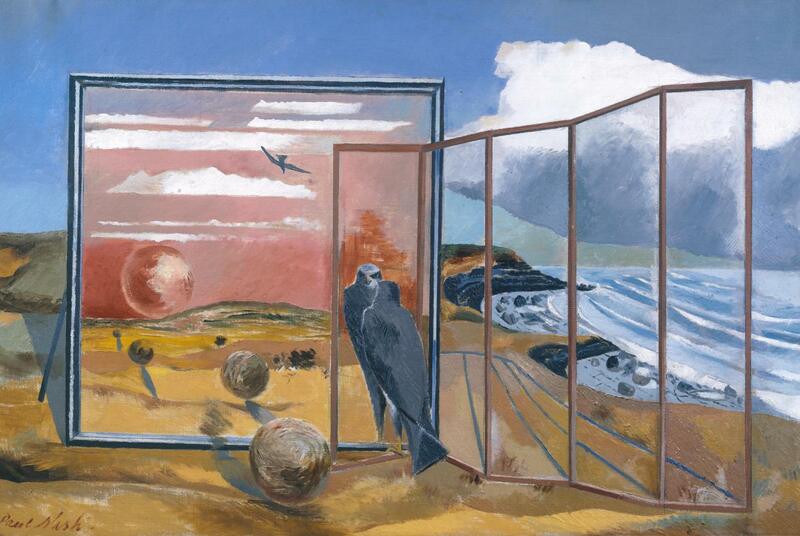 Paul Nash died of the chronic effects of his asthma on his heart and circulation. For both, particularly during the later years of their life, their art was constrained by their health. It is worth remembering that Thomas Girtin, who promised to be the equal of JMW Turner, if not a better painter than him, died very young as a result of asthma. 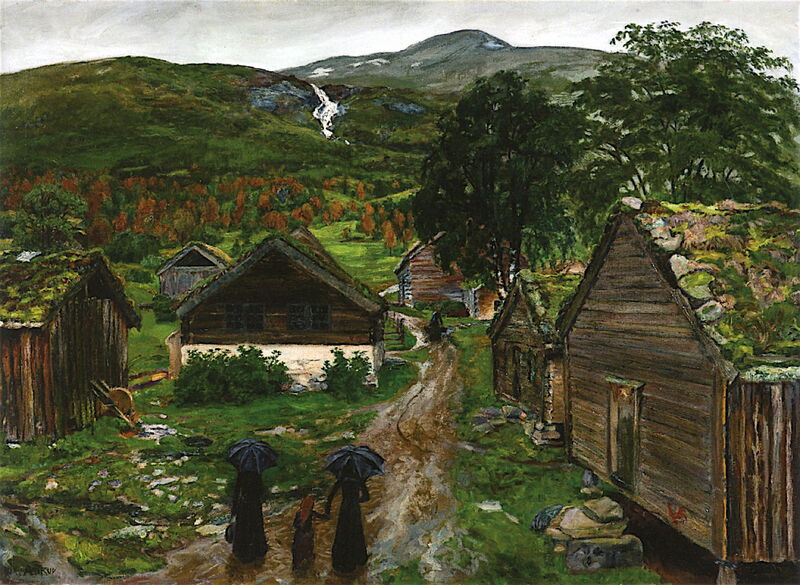 Astrup’s early influences were Henri ‘le Douanier’ Rousseau and Harriet Backer. With his love of Rousseau, in particular, he painted landscapes which try to be true to nature, but with an assumed naïvety. He often understates or omits aerial perspective, and incorporates multiple perspective projections into the same image. 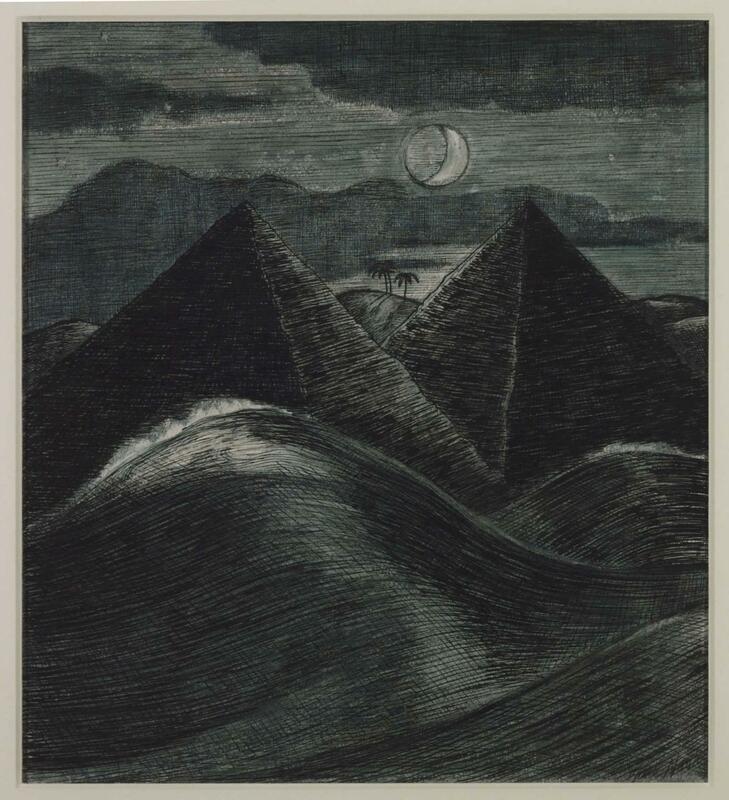 Paul Nash was twelve years younger than Astrup, and from the outset appears most influenced by Samuel Palmer and William Blake. Instead of the naïve, he sought to express his vision through the landscape, rather than trying to depict it faithfully. That is frequently realised by quite rigorous geometric constructions, and the dominance of linear and planar forms. 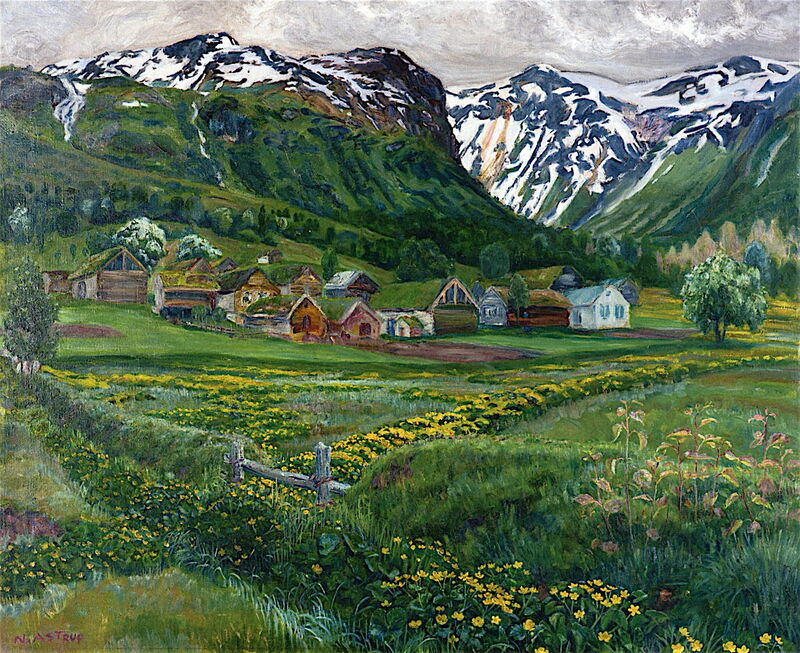 Astrup uses high chroma colours and relatively fine detail in landscapes which are often quite painterly. His motifs are drawn from the dramatic hills and mountains very close to where he lived, and include more intimate rustic scenes and rites. Although his landscapes are sometimes devoid of people, they seldom appear deserted or abandoned. Nash uses lower chroma colours and in many landscapes employs patterned brushstrokes which may have been influenced by Cézanne’s ‘constructive’ brushstroke. His motifs are drawn from typical English Home Counties areas, usually near to where he was living at the time, but he moved quite frequently during his career. Except in some of his war paintings, he includes very few figures in his landscapes, which are normally unnaturally deserted. 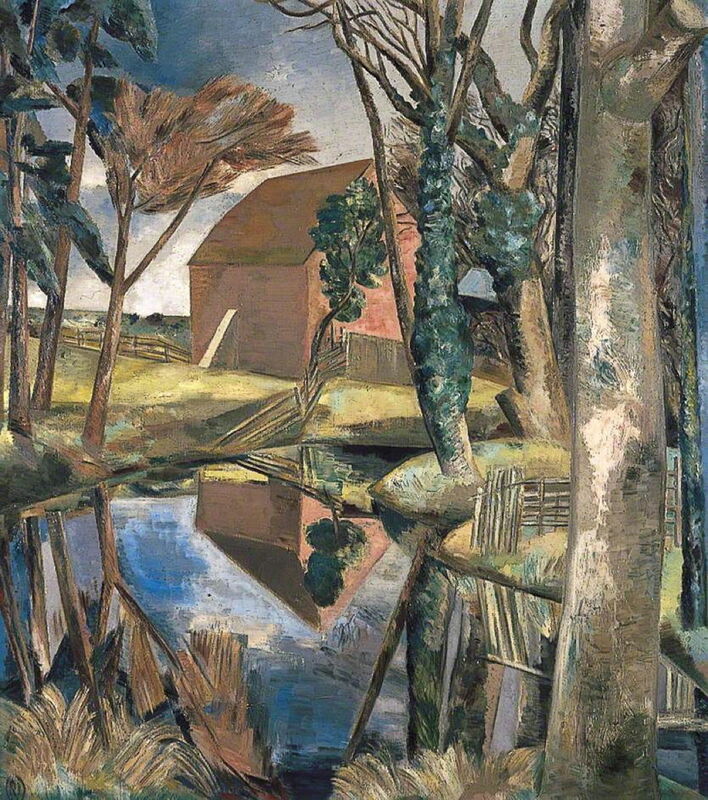 Paul Nash (1892–1946), Oxenbridge Pond (1927-28), oil on canvas, 99.7 x 87.6 cm, Birmingham Museums and Art Gallery, Birmingham, England. The Athenaeum. 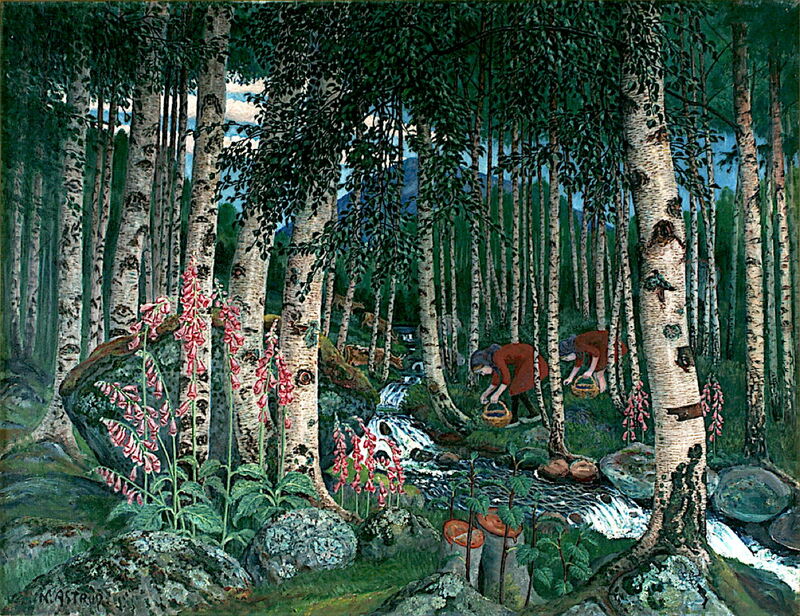 In the first half of his career, Astrup started to paint motifs which are associated with more ritual occasions, such as the festival of Midsummer’s Eve, often in unusual light. In these, inanimate objects such as the flames from this bonfire assume a life of their own. In the middle of his career, Nash became overtly surrealist, composing paintings by juxtaposing incongruous objects which are often symbols of the intangible and unpaintable. Some are inspired by ancient landscapes, including the megaliths in central southern England, but the strangeness of his images more often results from seeing familiar objects in very unfamiliar combinations. For Astrup, the objects within the image start to take on their own lives. Cut corn drying on poles becomes an army standing stock still. He does not have to import objects which were not there in the first place, but to re-interpret their form and appearance to make them appear praeternatural. 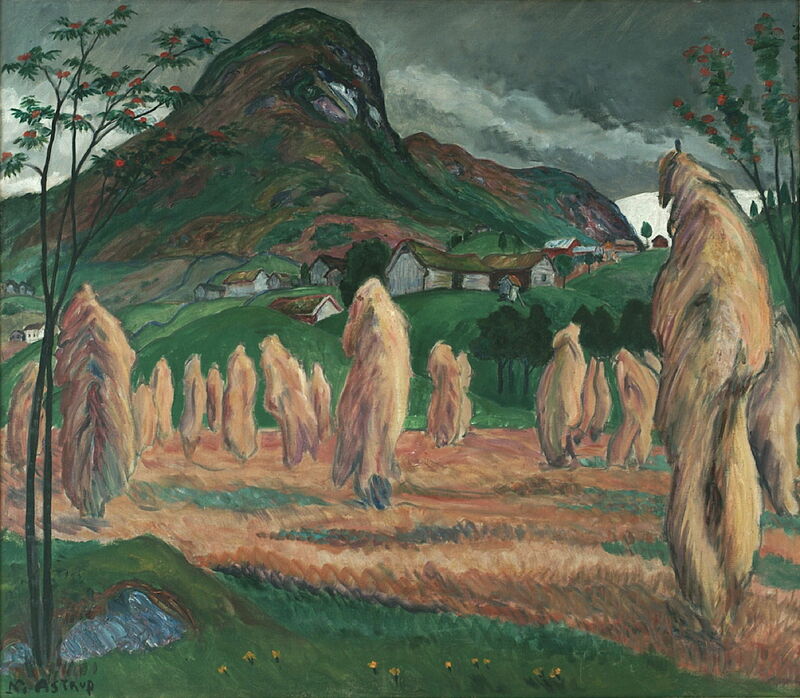 Nikolai Astrup (1880–1928), Corn Stooks (1920), oil on board, 90 x 104 cm, Bergen Kunstmuseum, KODE, Bergen, Norway. The Athenaeum. Nikolai Astrup (1880–1928), Foxgloves (1920), oil on canvas, 77 x 99 cm, Bergen Kunstmuseum, KODE, Bergen, Norway. The Athenaeum. 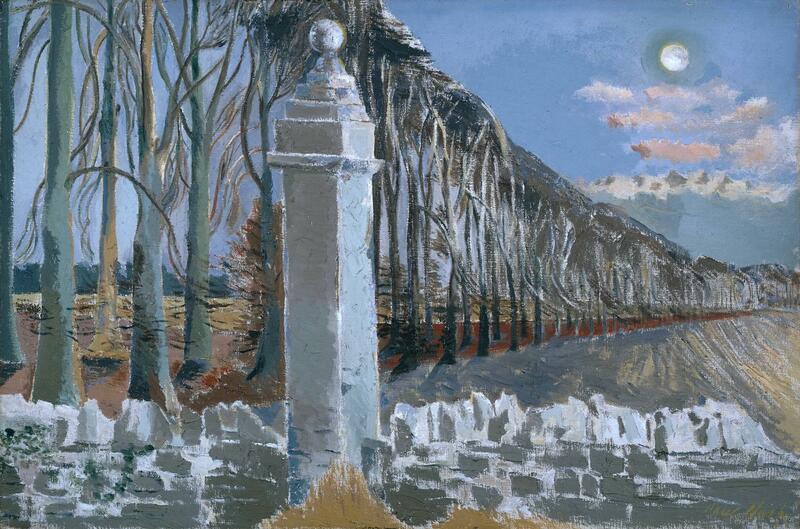 Nash’s eery, empty landscapes draw parallels between disparate objects which are similar in form, such as the full moon and the stone sphere on top of a column. Other elements, such as the avenue of trees, assume a military or mathematical regularity which transforms the natural into the unnatural. Astrup’s rugged rock peaks become the head of a giant owl, peering down at his moonlit unreality. The everyday act of milking a goat becomes strange when it takes place in the dead of night. Marsh marigold flowers, which we typically see in the summer sunshine, still glow yellow under the bright yellow moon. Nikolai Astrup (1880–1928), The Befring Mountain Farms (c 1924-28), oil on canvas with woodblock printing, 89 x 110 cm, Private collection. The Athenaeum. 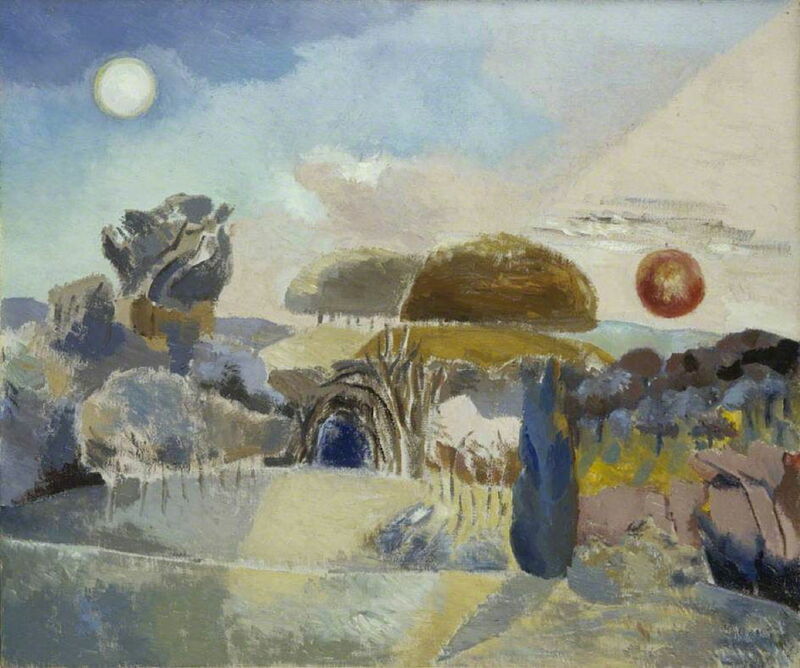 Nash’s landscapes quote mystical places, such as the Wittenham Clumps, against which he poses the physical impossibility of the deep red sun next to a full moon. 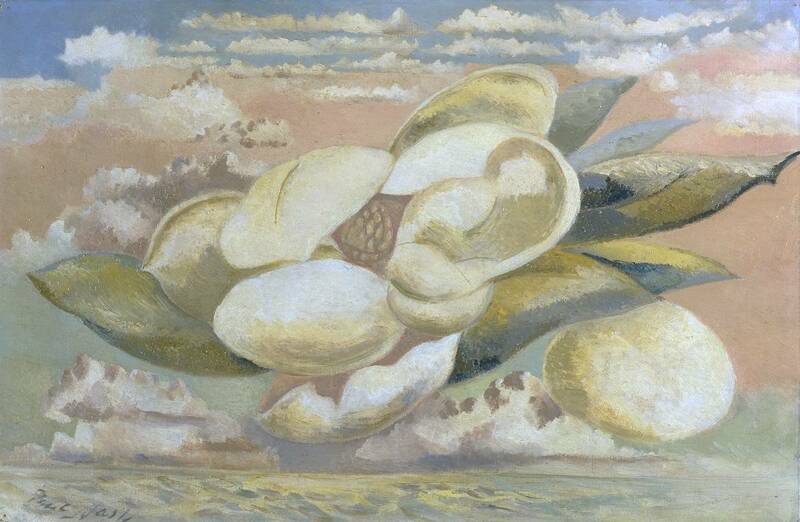 A heaped bank of cloud becomes a vast plant, the form of one of its petals reminiscent of a human ear, with the invited misinterpretation of an included human figure. 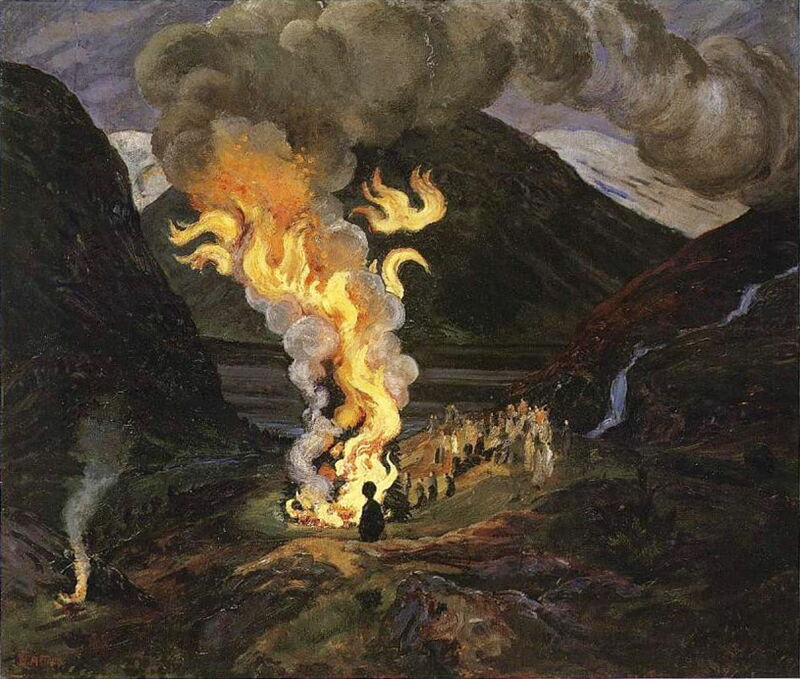 Astrup’s magic is primarily generated by leading the viewer to imagine that what was there was actually something quite different: flames from a bonfire detach and take on a life of their own; corn stooks become a standing army; rugged rock faces change into owls. His choice of motif – in particular, the time (often the ‘magical’ period of night), light, and content which can readily be misinterpreted – is key, but there is no evidence that he recomposed his motifs to any significant degree. 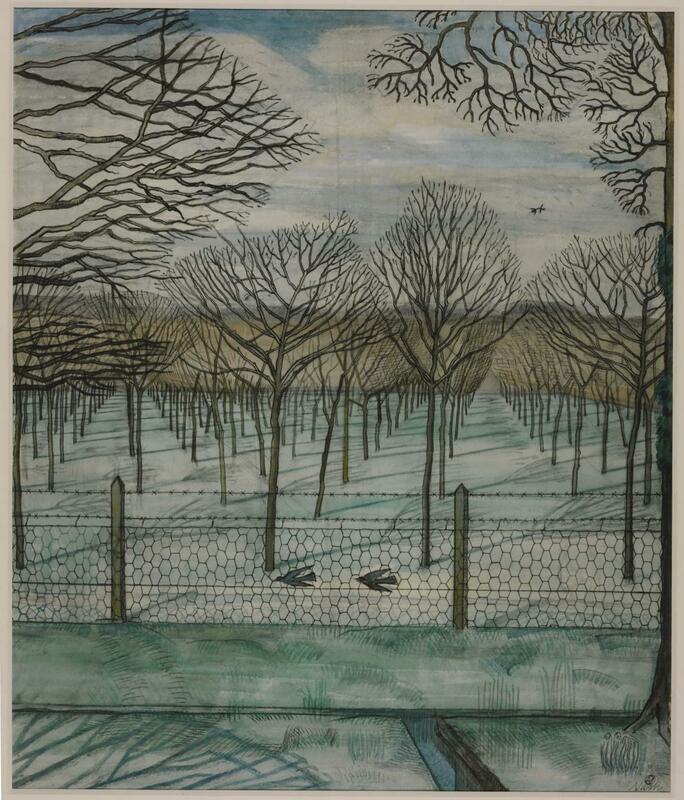 Paul Nash’s magic is primarily compositional: it is not so much the way that he depicts individual elements within a landscape, but his choice of elements to create that landscape. Like Samuel Palmer and William Blake before him, he paints a vision which exists in his mind rather than in any momentary physical reality. They were both wonderful artists, who painted some of the best landscapes of the twentieth century. But the magic which they breathed into those landscapes came from quite different sources. I hope that you have enjoyed their paintings as much as I have. Posted in General, Painting and tagged Astrup, Backer, Blake, landscape, Nash, painting, Palmer, Rousseau, surreal, Surrealism. Bookmark the permalink.